Once again, The Jedi Assembly is represented at Star Wars Celebration! Please come say 'hello' to us at booth #5236 in the Exhibit Hall, located just under the Tattoo Pavilion sign and adjacent to Funko. 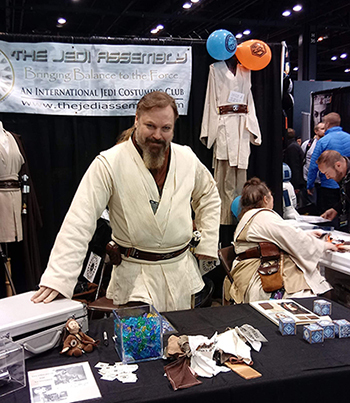 Thanks to all who have stopped by and entered our raffle drawing for a hand-sewn, custom-hemmed Jedi tunic and belt. All proceeds will be donated to St. Jude's Children's Hospital. The raffle will be drawn on Monday, April 15th at 3PM (local) with Steve Sansweet of Rancho Obi-Wan pulling the ticket. Come visit us at booth #5236! 10/26/2015 - NEW COSTUME STANDARDS!